Simon Wilson’s last lap attack was enough to earn him victory in the Clayton Velo Spring Classic Handicap in Lancashire on Sunday. The 33-year-old Burnley man, riding for Wheelbase-Altura this season, bided his time as the 54-mile race progressed and the groups began to merge, but once a leading group had got established he put the hammer down. He crossed the line unopposed with David McGowan of Metaltek second and Rapha Condor’s Richard Handley in third. And as an added bonus Wilson’s girlfriend Rebecca Rimmington won the women’s race. Afterwards, Wilson said: “Going into the last lap I clipped off the front just as another group of four got across to the leaders. Everyone hesitated so I got a gap, and at the line there was no-one else in sight. Elsewhere, Peterborough’s Steve Lampier (Velosure-Giordana) celebrated his latest win as the 29-year-old raced to first place in the Velo29 North East Trophy. Alistair Rutherford, 32 and of Wheelbase Altura, came second in the race held at Croft Racing Circuit in North Yorkshire. Jack Barrett, 20, took third spot for his team, The Racers. Noah Goodman of Bristol RC put in a strong performance to take top spot on the podium in the second Mid-Devon CC Springtime Pursuit. Riders were greeted by a dry day with sunshine in the morning and a fresh westerly wind making the leg between Beara Cross and Dunsland Corner testing. A group of 19 set off at electric pace with that number being almost halved after the first 11.5 mile lap. The leaders kept up their hard work and there was an eight-man sprint contesting for honours with Goodman having several lengths advantage over Cyclelogic’s Martyn Lewis and Stephane Pang of Onit Sports. Simon Brooks has long had the Apres Winter League wrapped up but he was awarded his silverware after yet another win in the 13th and final round. The VC St Raphael man broke away with Southdown Bikes rider Stuart Bettis and the duo managed to keep the rest of the field at bay. Jason Edwards finished third and in the women’s race, Jasmyn Muller of Kingston Wheelers won in the break. 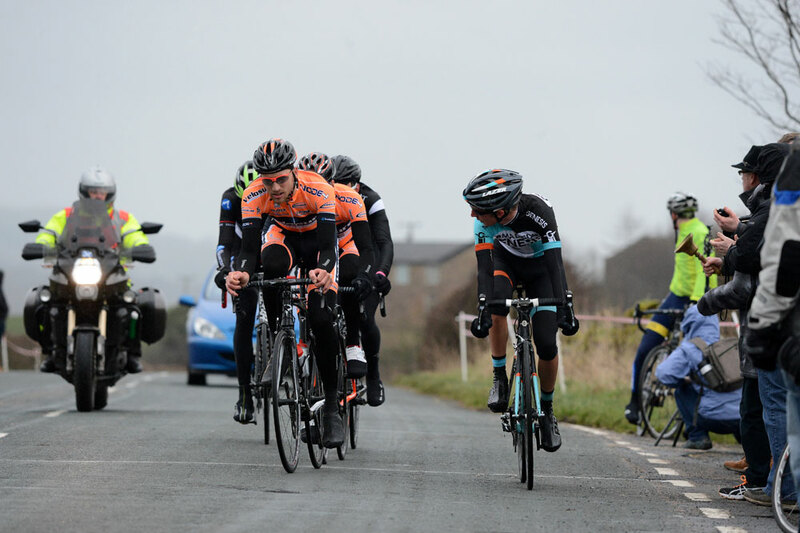 It was a good day for NFTO as they scored a one-two in the Forza Cycles RT Season Opener at Llandow Motor Racing Circuit in Vale of Glamorgan. Former continental pro Adam Blythe finished first and team-mate, James Lewis was second.